This is the time of year when the chill of winter begins to subside, and we look forward to the long-awaited spring. In 2018's installments of "Teishoku of the Seasons," in addition to the seasonal menus covered so far, we'll also be looking at traditional foods from across Japan—with a focus on Kyoto, the city that birthed Japanese culture during its 1000-year reign as the nation's capital. Our country, Japan, sees the beauty in the changing of the seasons. By enjoying the plentiful flavors that the seasons yield, we give thanks to nature for its blessings. Let's delve deeper into the Japanese food culture that has been passed down for countless generations. This dish, consisting of the bony parts of sea bream cooked with burdock, pairs well with boiled white rice. The delicious flavor of the sea bream blends in with the aroma of the burdock. ❶Cut the bony parts of the sea bream into pieces of appropriate size, and sprinkle with salt to reduce the smell. Dip into boiling water, then remove the scales and dark red meat of the fish using running water. ❷In a pot, bring ingredients in group A and the water to the boil, then add the ingredients from ❶ and simmer for roughly 8 minutes on a slightly-strong medium flame. Increase the heat slightly and add parboiled burdock, then simmer for another 2 minutes (approximately) while stirring. When simmering the ingredients at the end, if you spoon over the broth while stirring the ingredients, the ingredients will acquire an attractive glaze. 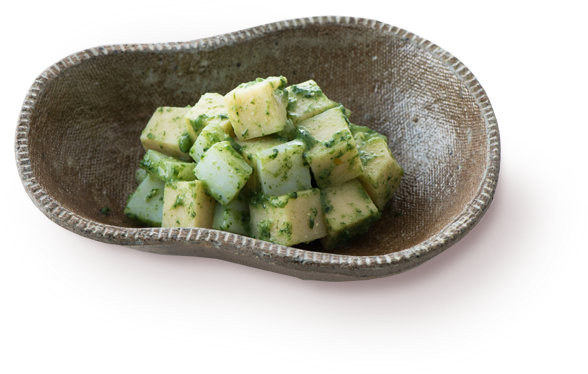 This dish pairs the delightful difference in texture between the squid and bamboo to create a colorful green salad. This is a truly seasonal dish that brings out the fragrance of sake and the refined flavor of white miso. We paired a recipe from the Edo-period cooking book "Manbō Ryōri Himitsubako Tamago Hyakuchin" (Secret Trove of Culinary Treasures: 100 Egg Delicacies) with rapeseed flowers and shiitake mushroom. 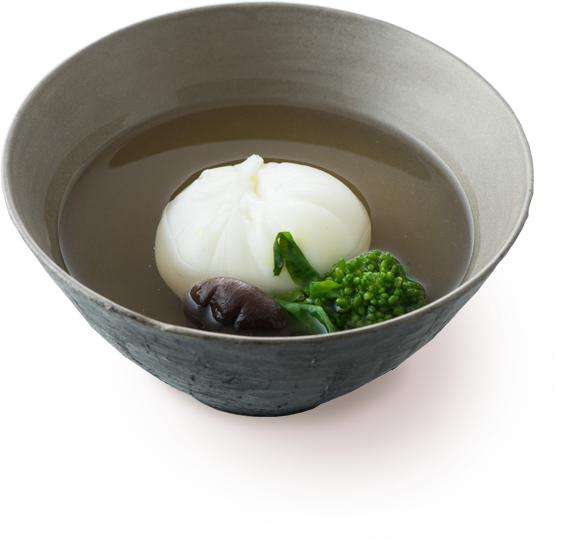 The charming egg is used as ingredients in the clear soup, which is evocative of the spring sunshine. 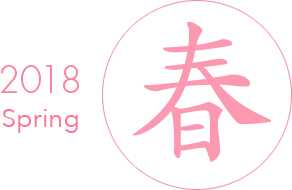 Hatsu-uma is the first "horse day" of February under the old calendar, in which days of the lunar month were associated with animals of the traditional zodiac. On this day, hatsu-uma festivals are held across Japan at Inari shrines to pray for bountiful harvests and prosperity in business. The main shrine of the 30,000 Inari shrines believed to exist in Japan, the Inari Taisha shrine in Fushimi, Kyoto, sees a great number of visitors coming for hatsu-uma. 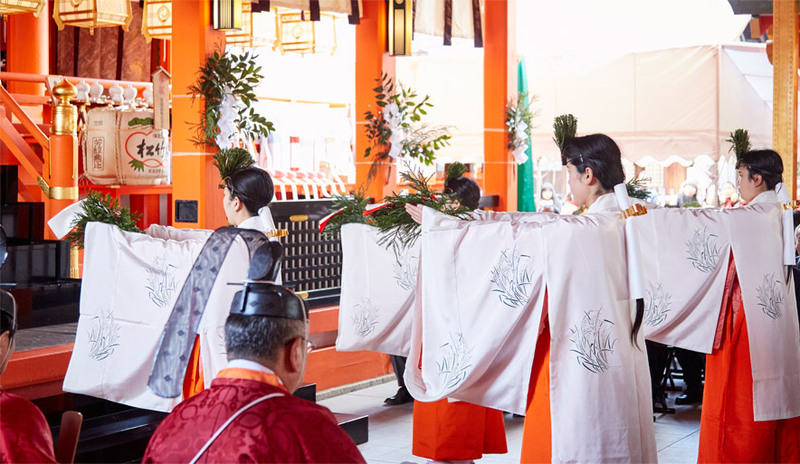 Fushimi Inari Taisha features an auspicious item called shirushi no sugi (cedar signs), which are cedar branches used as talismans. These are received as a sign of having worshipped, and are used to pray for bountiful harvests and prosperity. 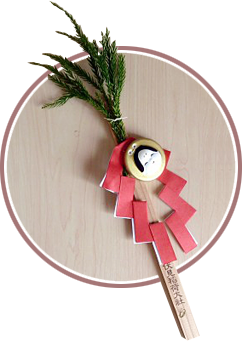 Shirushi no sugi have an ancient history, and during the Heian period of Japanese history, there was a custom in which people would cut a branch from the cedars of Fushimi Inari Taisha and wear it as a talisman on their way home. 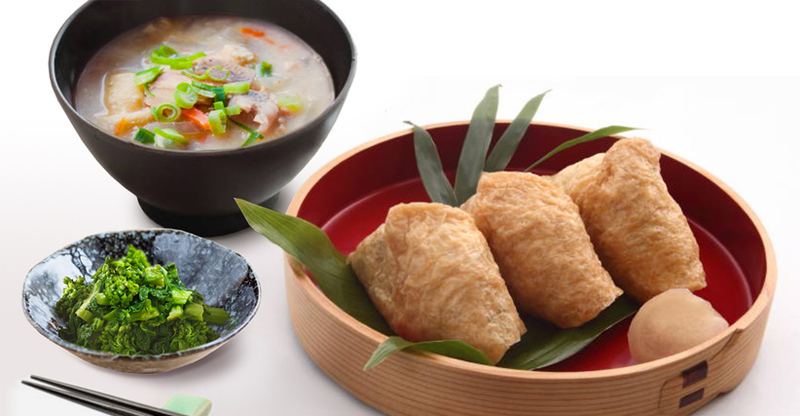 On hatsu-uma in Kyoto, it is customary to eat inarizushi (rice stuffed in fried tofu pouches), green vegetables dressed with mustard, and kasujiru, a soup made with sake lees. Inarizushi is eaten across Japan, but the version made in the Kansai region, where Kyoto lies, is made in a triangular shape. It is said that this shape represents Mt. Inari and the ears of foxes, the messengers of the kami Inari. Kyoto-style inarizushi is made using rice mixed with some added ingredients. Kyoto carrots and burdock are mixed with hemp seeds, sesame seeds, yuzu, and other ingredients, creating a version of inarizushi that provides an enjoyable texture and aroma. 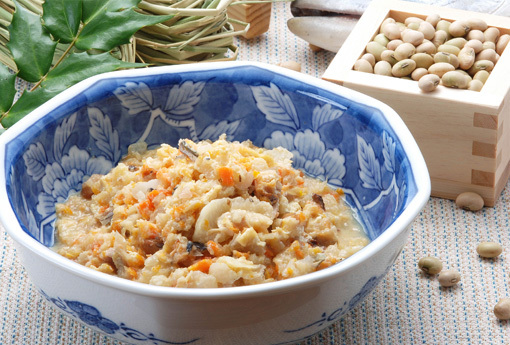 Shimotsukare is an item of northern Kanto cuisine that is largely associated with Tochigi Prefecture. This is a preserved food made of coarsely grated vegetables (using a bamboo grater called an oni-oroshi), salmon head, soybeans, and deep-fried tofu that have been simmered in a pot until soft, with sake lees added for flavor. For the farmers of old, hatsu-uma was a time when winter had only just passed and food was scarce. 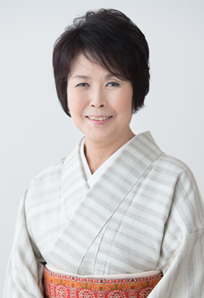 It is said that shimotsukare was the result of taking advantage of salted salmon from the New Year and soybeans from setsubun to make an offering for hatsu-uma. 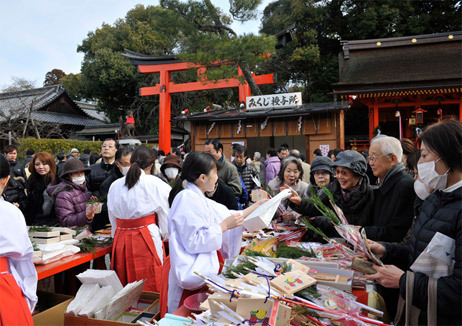 On hatsu-uma in Tochigi Prefecture, festive red rice and shimotsukare are offered at Inari shrines to pray for sound health. 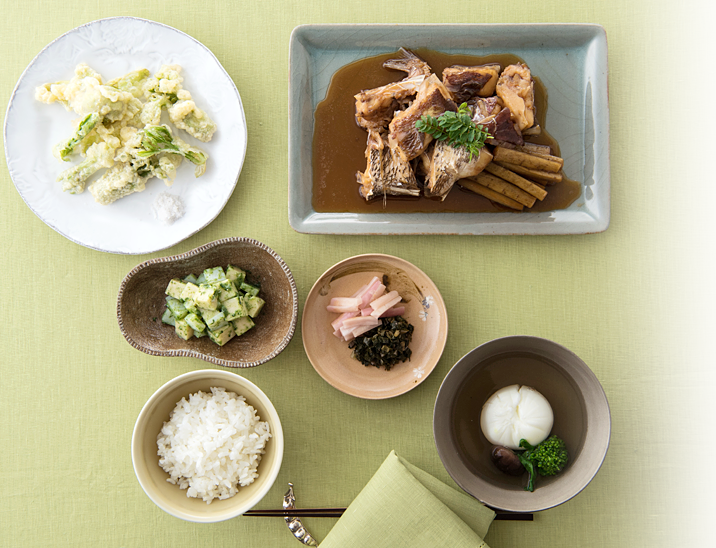 The flavor of shimotsukare differs across regions and households, and there is a saying that if you eat the shimotsukare of seven different homes, you will not fall ill.